In 1956, following cautious political criticism of Stalinism, a partial correction of ideological pressure and schematism briefly occurred in art and culture. In that year two feature films were made which differ partially from the schematic depiction of contemporary social relations and phenomena which had hitherto prevailed. The first of these, Andrej Lettrich’s Čisté ruky (‘Clean Hands’, 1956), depicted the post-war process of forced collectivisation in agriculture and the unfairness and careerism of Communist Party officials. This attempt to depict the negative consequences of political ideology on the life of the individual drew sharp criticism from party cadres and eventually led to a final ban on its distribution and a decision to destroy all the prints and other materials relating to the film. Nevertheless, a duplicate of the film negative was preserved and the film was publicly presented in 1968 for the first time. 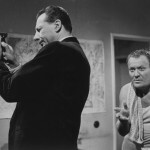 Čert nespí (‘The Devil Never Sleeps’, 1956), a satirical film vignette by directors Peter Solan and František Žáček, drew on the short stories of writer and dramatist Peter Karvaš. In addition to social satire, the directors depicted with fine irony the process by which films were politically assessed at that time. Despite its literary method of storytelling, this film was one of the most distinctive feature works at the time of its creation and greatly contributed to the broadening of the thematic and genre orientation of Slovak film in the second half of the 1950s. At the beginning of 1959 the first Festival of Czechoslovak Films took place in Banská Bystrica. It was originally expected to support new trends in film that were based on the criticism of the previous period of Stalinism. However, under the order of the Communist authorities, the festival eventually became a platform for the political criticism of several works, the authors of which had begun to apply the principles of free thought and a more personal approach (especially the Czech films of Ladislav Helge, Vojtech Jasný and the Ján Kadár-Elmar Klos team). The sharp criticism of the promising developing creative trends in Czech and Slovak films delivered by party officials led to personnel changes in the management of the state film enterprises, a temporary tightening of political supervision in the approval of film themes, their repeated ideological selection, the ‘setting aside’ of some films in the archives and the removal of their authors from film production. As a result of this ideological and political step, the orientation of the feature film now reverted to popular and ideologically ‘neutral’ genres. One of these involved the continued development of the comedy film, in which director Ján Lacko assumed the dominant position in the late 1950s and early 1960s. In 1958 Lacko made two comedies. 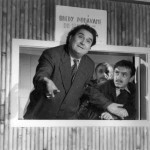 In Statočný zlodej (‘An Honest Thief’), a well-crafted adaptation of Ivan Stodola’s play Jožko Púčik a jeho kariéra (‘Jožko Púčik and His Career’), the director crafted a fine comedy featuring noteworthy comedic performances by leading Slovak actors. This was followed by Šťastie príde v nedeľu (‘Luck Comes on Sunday’), based on the story and screenplay by Ivan Bukovčan. The latter film portrayed a series of witty situations involving a trio of main characters, debunking the illusion of getting rich quick in the lottery. The authors of the film again built on the genre of situation comedy, with rich characterisation and a superb cast. Both of these films opened the door for Lacko to gradually develop situations and characters in his subsequent film comedies. The films made by Ján Lacko in the 1960s – Skalní v ofsajde (‘Soccer Fans’, 1960) and Výlet po Dunaji (‘A Trip Down the Danube’, 1962) – constituted the culmination of his comedy work, representing as they did a significant shift in craft and enjoyed considerable success with cinema-goers. Crime stories, represented in particular by the work of screenwriter Jozef Alexander Tall, became the other distinctive film genre during this period. The earliest example of this genre was the 1959 film Muž ktorý sa nevrátil (‘The Man Who Never Returned’), directed by Peter Solan and based on his own screenplay which, thanks to a well-composed story and accurate directing, laid the foundations for the flowering of the Slovak crime movie during the 1960s. A series of films, including Smrť prichádza v daždi (‘Death Comes in the Rain’, 1965), Vrah zo záhrobia (‘Murderer from Beyond the Grave’, 1966), Volanie démonov (‘The Demons are Calling’, 1967), Prípad krásnej nerestnice (‘The Case of the Dissolute Beauty’, 1973) and Šepkajúci fantóm (‘The Whispering Phantom’, 1975) was later made in co-operation between Jozef Alexander Tall and director Andrej Lettrich. They constitute a skillful and attractive depiction of the genre, with an emphasis on a high-quality cast. The two-part historical film Jánošík I and Jánošík II (1962-1963) made in colour by director Paľo Bielik, occupies a special place amongst the spectator-oriented genres of the 1960s. Set to Bielik’s own screenplay, this popular cinemascope epic updated the national legend with its strongly heroic depiction of the central character.